Westfield Augers (Australia) Pty Ltd introduces the latest model in their swing away auger range featuring a 10-inch tube. 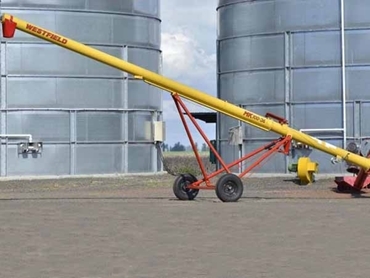 First introduced in the market over 30 years ago, the MK series swing away auger design has evolved over the years with the latest model, the MK100 series offering a practical and economical product. Key features of Westfield’s MK series swing away augers include internal gearboxes to ensure maximum 163 tonne per hour capacity does not drop off when the auger is raised; extra heavy flighting in critical grain transport points ensuring durability; undercarriages specifically designed for each auger length for more stability and durability; and A-frame undercarriage design ensuring the auger tube has maximum support during transport and operation and less side sway when positioning over a silo. The latest MK100 - 36 is a 36-foot model specifically designed for out-loading from flat bottomed silos, with the large hopper causing less spillage. The auger also includes the convenience of PTO drive.